So it has finally warmed up here. Yes, we still have the random cool, rainy day, but anything is better than sub-zero temperatures, so I’m not complaining! I have another fun cake mix recipe for you today. I’ve been loving using cake mixes and boxes of Jell-O to create new treats for you. There are unlimited flavor combinations using these! And one of my absolute favorite desserts is pound cake. When I realized you could make a simple pound cake out of a boxed cake mix, I was one happy girl. Typically when I think of baking a treat I head towards the chocolate. After all, chocolate cures everything, right? It’s in this warmer time of year that I start thinking lemon desserts. I love lemon desserts. They are quite the opposite of the rich, chocolate delicacies that I so enjoy, but there’s just something fresh about the flavor of lemon that I start craving as the weather warms. The lemon Jell-O in this cake mix recipe gives a blast of lemon flavor that will make your taste buds smile. Don’t forget the lemon glaze that gets drizzled on top of this cake. My kids said that simple glaze is what made it unbelievably good. Allow this cake to cool completely before serving. In fact, this is a great cake to make a day in advance. Although I must admit that the last time we made this, it didn’t make it through the day! Store it in the fridge for a cool, refreshing after dinner dessert…or early morning treat! 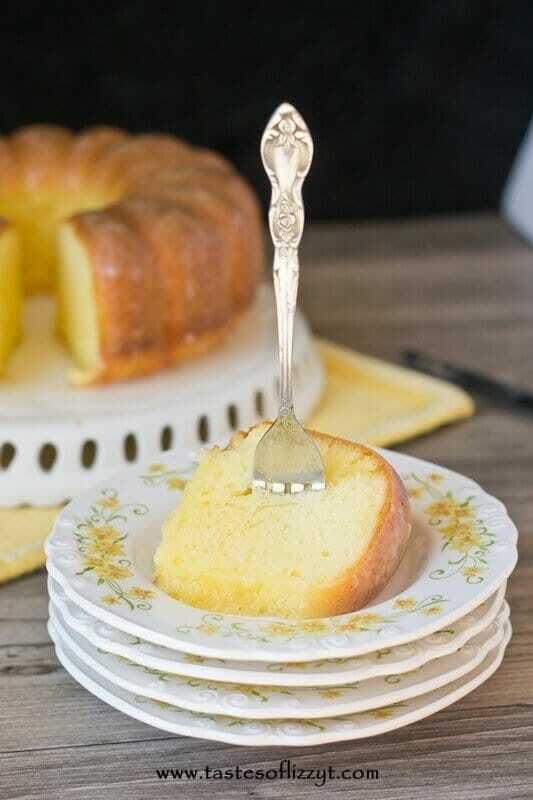 You'll love that this simple Lemon Pound Cake starts with a cake mix and a box of Jell-O! It's moist and full of lemon flavor which means it is perfect for spring! Combine the Jell-O with the boiling water and allow it to cool. In the bowl of a stand mixer, combine the cake mix with eggs, adding the eggs one at a time. Add the cooled Jell-O, lemon extract and oil. Mix two minutes on medium speed. Pour into a bundt cake pan that has been coated with shortening and flour. Bake at 350 degrees for 35 minutes or until a toothpick comes out clean. An hour after the cake comes out of the oven, invert the cake onto a plate. In a small bowl, mix the lemon juice and powdered sugar. Slowly pour the glaze over the cake.